Its that time again for Muse :Christmas Visions and we have a guest designer Emily Leiphart!!! So thanks Emily for getting me to put my thinking cap on!.... and actually I kinda like this one now that its made,came out better than I expected. Well off to make the tea now squeezed in some crafting time before the family comes in. This is very sweet! Love the shading on your snowman and the forest backdrop! So glad you joined us at MCV this week, Jenni! So cute! Love how you incorporated the black and white border! Great to have you playing with us at MCV! 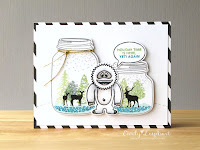 This is a great take on the Muse card, love your kind snowman! Great interpretation of Emily's card! Such a sweet and adorable card...love your snowman! Your card is perfect, Jenni! I loved your thought process on conceiving this wonderful scene. Thanks so much for playing along with Muse Christmas Visions!